Welcome to the diversity and inclusion initiative of the Lansing Economic Area Partnership (LEAP)! The rich tapestry of diversity represented in the Lansing region is what makes this such a great place to thrive, succeed, prosper and explore. We strive to improve the overall quality of life for all the residents of Eaton, Clinton and Ingham counties and to assist businesses in attracting and retaining world-class talent. Everyone is welcome at the table and to be a part of the conversation. To get involved or to learn more, please click here. 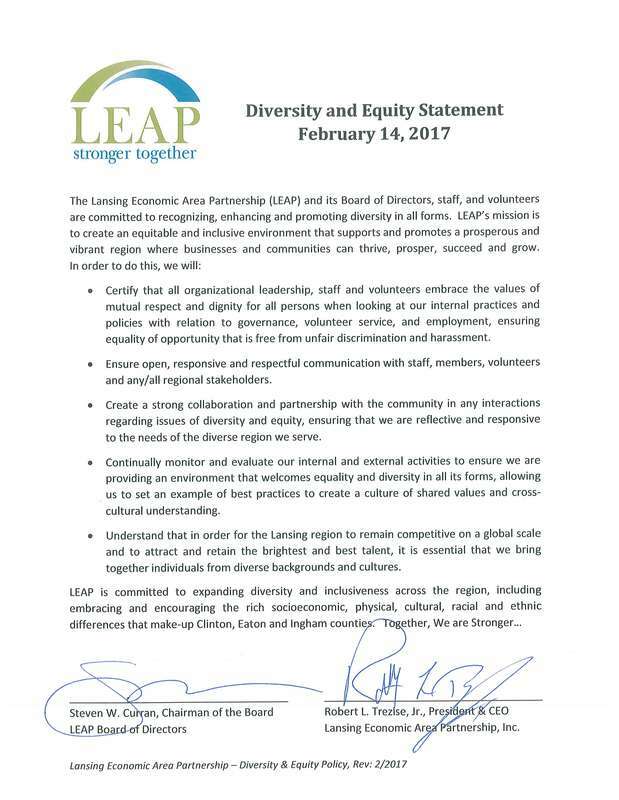 ​As part of our commitment to ensure diversity is represented in all its forms, the LEAP Board of Directors signed its Annual Diversity & Equity Statement on Tuesday, February 14, 2017 at the LEAP Board of Directors meeting at AF Group, Lansing, MI. Thank you to our members, staff and regional partners for ensuring diversity is embedded into every aspect of life here in the Lansing region. Together, we are creating stronger families and stronger communities.